C.J. 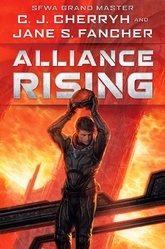 Cherryh returns to the Hugo-award winning Alliance-Union Universe with Alliance Rising—a thrilling new entry in her far-reaching sci-fi saga. When the Alpha space station receives warnings of an incoming ship with no identification, the station’s denizens anxiously await news on the outsiders. Some crewmembers believe the ship belongs to the Pell station, which has an interest in The Rights of Man, another massive and mysterious ship docked at Alpha. Captain James Robert Neihart has heard whispers of The Rights of Man, and wonders about its design and what its true purpose could be. Now stationed on Alpha, he must convince the crews that more is happening with the giant space stations than meets the eye.